Magic Money wristbands are reusable and easy to reload! 1. Purchase your Magic Money wristband at any ticket window, and choose how many credits to load onto your wristband. A $2 service fee will apply to your initial purchase. 2. 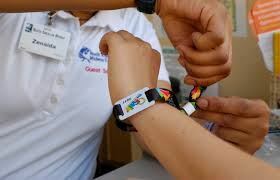 Use your Magic Money wristband at any ride, game, or concession; ride operators and food vendors will have a handheld scanner or a touchpad. 3. Reload your Magic Money wristband using cash or credit card when you’re ready for more credits. Magic Money is available in increments of $20, $40, $60, $80, and $100, and can be reloaded in any amount! No fee to reload. To check how many credits you have available, ask for a readout from a ride operator or food vendor, or download the FREE Magic Money app on Google Play or the App Store. Keep up with Magic Money activity from your phone, no matter where you are. Food vendors will accept Magic Money. 1. Download the FREE Magic Money app on Google Play or the App Store, so you can reload whenever, wherever! 2. Visit one of the Magic Money kiosks located around the fairgrounds. 3. Visit any ticket window. so they can be used at next year’s Fair! Keep up with your wristband each year. cybersecurity, so you can enjoy the Fair in peace. A Better Way to Pay and Play! Magic Money: A Better Way to Pay and Play! How does Magic Money work?